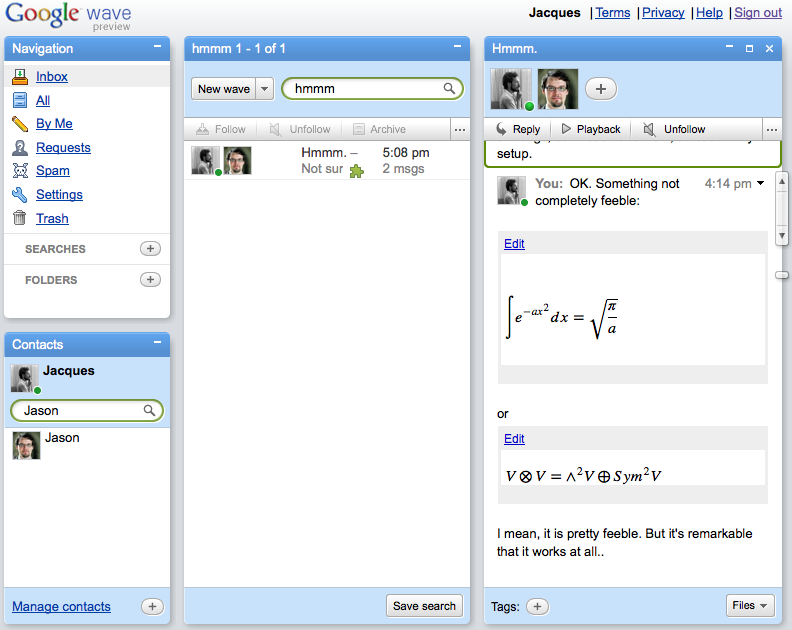 I’ve been playing around with Google Wave, and the Oxyxy Gadget. Yes, that’s some dialect of LaTeX, rendered to MathML. There is a desktop client for MacOSX, called Waveboard. As you’d expect, it renders the above Wave as gibberish. Great blog Professor Distler, I was wondering what you think the impact of Google Wave will be for scientific collaboration? To some degree, there cannot be collaboration unless there is a willingness on the various parties to work together, but I feel as is geographic boundaries will no longer be an issue with new applications such as Google Wave. There are lots of tools for online collaboration. Email’s been around since the mid-’80s. I’m not sure how much Google Wave actually brings to the table. It’s got elements of email, instant-messaging and a wiki-like ability to go back and edit previous entries in a wave. The hope is that the combination is more compelling than its individual parts. Maybe it will be. I can’t really say I’ve had enough experience, yet, to judge.